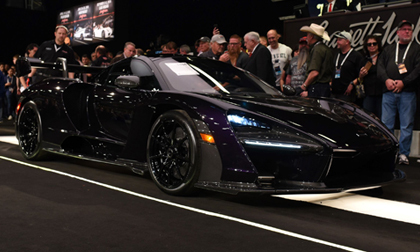 SCOTTSDALE, Ariz. – Jan. 21, 2019 – Barrett-Jackson made history last week when it sold more than 1,800 vehicles, the largest public No Reserve collector car auction ever held, during its 48th Annual Scottsdale Auction, January 12-20, 2019, at WestWorld of Scottsdale. In total, over 1,800 vehicles sold for over $118 million with a 99.74% sell-through rate, while over 1,500 pieces of automobilia brought in over $4.05 million, and $9.6 million was raised through the sale of charity vehicles, bringing the total auction sales to more than $131.6 million. The weeklong automotive lifestyle event also hit a new milestone with over 5,300 bidders and a record number of guests. Barrett-Jackson continued to create, define and lead the trend of modern supercars and professionally built Resto-Mods coveted by a growing number of younger buyers. As the leader of the collector car market, the Barrett-Jackson Scottsdale Auction showed that supercars and professionally built Resto-Mods are in high demand. Prewar classics, which have been historic staples in the Saturday offering, were joined by modern supercars like a 2019 McLaren Senna (Lot #1405) and professionally built Resto-Mods like the1967 Chevrolet Corvette Resto-Mod Convertible (Lot #1078) (Dawn of the Resto-Mods video). The shift is being driven by younger buyers, like singer/songwriter Ray J, who was the winning bidder of a 1967 Chevrolet Camaro Resto-Mod Coupe (Lot #3004). To help ramp up the excitement this year, Barrett-Jackson hosted some of the biggest names in entertainment, sports and business, including Emmy and Golden Globe award-winner Gary Sinise, singer/songwriter Ray J and NASCAR Hall of Famer Jeff Gordon. Other celebrities in attendance included Alice Cooper, David Ragan, Rusty Wallace, Bruce Arians, Archie Bradley, Richard Petty, Dave Kindig, Kurt Busch, Dan Quayle, Richard Rawlings, Mike Martin, Arie Luyndyk, Bill Simpson, Jeff Gordon, Charlie Nearburg, Don Prudhomme, Tim Allen, Jacoby Ellsbury, Marco Estrada and Anthony Rendon.